Since puberty I have been dealing with clogged pores. Especially on my nose. It made me really conscious about my appearance and I couldn't think of anything to do about it. They were really huge and when I ran my finger over my nose I could feel them. Yeah, gross I know. I thought they were disgusting, but I really didn't know what I could do about them. So after a few years I finally found something that helped me get rid of them (mostly). Keep on reading to get to know my nose's history more! It all started when I hit puberty. My T-zone got oily and I wasn't into skin care. I had moisturizers, but I don't think I was using them religiously. I don't really remember, it was about ten years ago. What I do remember is that I was starting to notice that my face was very greasy at the end of the day and that I wanted a cleanser. I also was getting a few pimples. Mostly on my forehead. I never had acne during my teens. I was seeing a lot of advertisements on the TV for Clearasil and Garnier. It supposedly helped against impurities and such. I bought the cleansers and face scrubs and started using them. I noticed that my skin was very clean (=oil free) after using and my skin was also very dry. It was very tight. So after cleansing my face under the shower, I put on moisturizer before going to sleep. In the morning I cleansed my face with a towel. I also used a toner sometimes to remove all the grease. My pores didn't get better but they also didn't get worse. 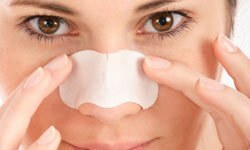 I purchased nose strips to remove all the gunk out of the pores. They only worked for a few hours. After a good night sleep they were back all clogged up! I really didn't understand how and why. Finding your answers on the internet wasn't really a big thing back then, but somehow I discovered that those cleansers were way too aggressive and could make the situation worse. I didn't know what else to use, so I simply continued using those aggressive cleansers, though I was trying different products after finishing one. As I got older my pores were getting worse. It started with little black heads and now they were really clogging up and getting big. I struggled with it for YEARS. Trying all the weird stuff I read in the internet. But nothing helped. I read things about salicylic acid, but that was an ingredient in my face scrubs. Years passed and I was 19 years old. My pores weren't as big as they were when I was 14-15, but they were still very there. I didn't like putting on foundation, because that would only emphasize their appearance. I noticed that when I moisturized my nose very well, my nose would get less greasy and the pores would enlarge not as quickly as it normally would. In the years passed I found out that physical exfoliants only worked for my pores (I was only using drugstore stuff). The Clarisonic was out for years and I really wanted one, but I thought they were very pricey and held off. I really wanted to try it and as if it was a sign from above, there was a 50 EUR discount on the Clarisonic. I was so excited and I HAD to go buy it. It worked well (I write something about the Clarisonic later), but my nose still wasn't as smooth as the noses of the YouTube beauty gurus. I also found that using clay masks would help a bit with the pores. Moisturizing masks don't do much for the pores regarding reducing them. I decided to buy some chemical exfoliants, because I had heard great things about acid peelings with acids. I ordered the 2% BHA and 8% AHA exfoliants from Paula's Choice and I couldn't wait to use them. Would this be the end of my clogged pores? I used the 2% BHA before going to sleep and the next day I my pores weren't clogged more than the day before. I continued using the 2% BHA and after a week I couldn't believe my eyes! The pores on my nose did almost not show a white head. They always have been so big that I could pull out the junk in my pores with a tweezer (disgusting I know) and now there was almost nothing to pull out. So my tip for those who suffer from clogged pores: don't give up. Go get yourself a Clarisonic, some salicylic acid, a good moisturizer and regularly put on clay masks!